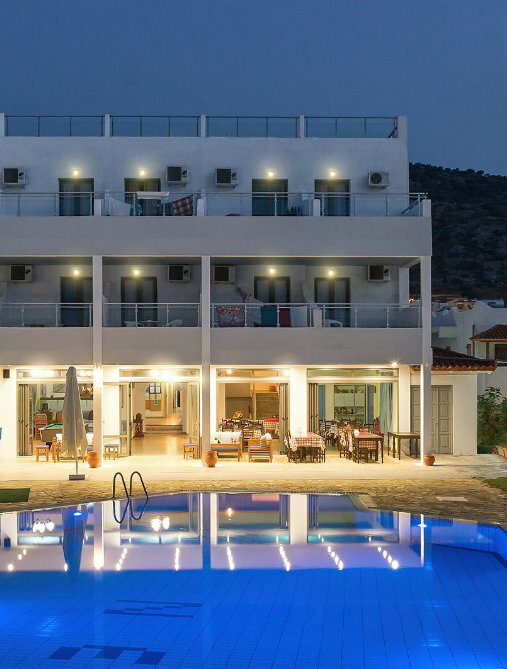 The Neon Hotel in Stalis Crete occupies an unbeatable position next to the beautiful sandy beach. 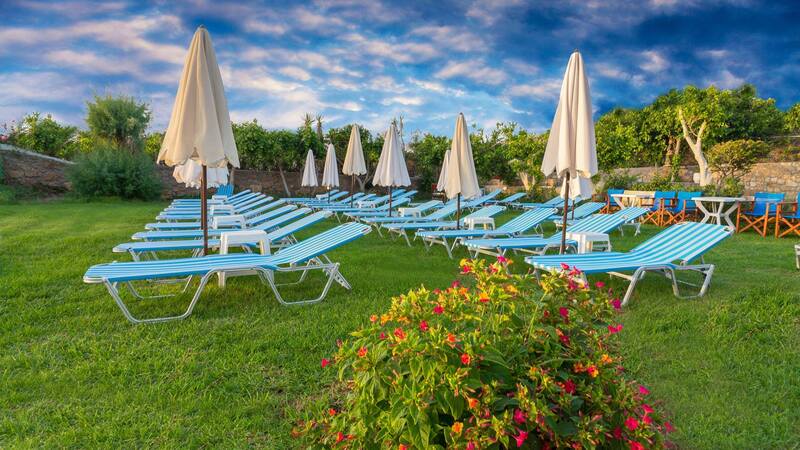 Our hotel is surrounded by flowers and Mediterranean vegetation with orange, lemon and other fruit trees. 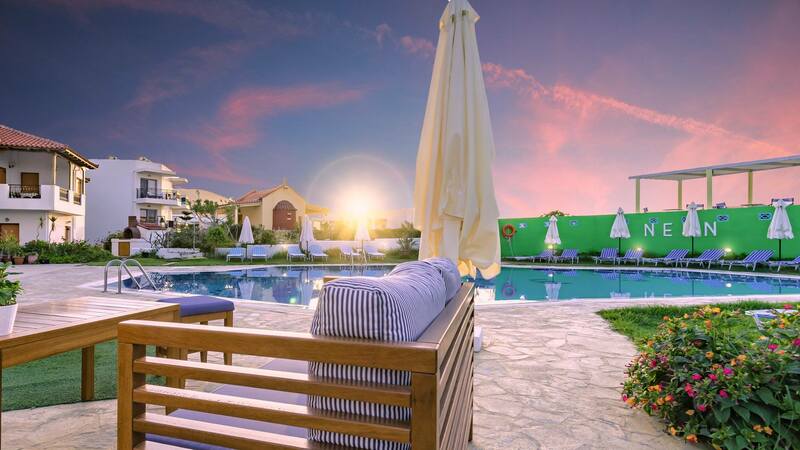 Neon Hotel offers guests everything they need for a relaxing vacation in the cozy beach resort of Stalis in Crete, Greece. Our family run hotel Neon offers quiet, clean accommodation in a friendly atmosphere. The basic rooms, some of of which have a private balcony with sea view, are non-smoking and are furnished in traditional island style. The philosophy of Neon Hotel is to ensure that our guests feel at home, away from home, and help make their holidays in Stalis memorable. Neon Hotel is a family owned hotel, designed and decorated with personal effort and taste by the owners. “ Location was great and the whole place was very clean. Very basic and the grass surrounding the pool was a bit un-inviting, but we're had a lovely little balcony, free air con, the next door hotels pool and snack bar was lovely. As long as you ate there the lovely Scottish bar lady was happy to let you swim etc. Top notch holiday right in the beach front! “ “It was our first time to Crete and we had a wonderful time and will be going back again.We were delayed six hours going, but when we landed the taxi i had pre-booked was there waiting and took us to our hotel. The hotel itself was clean and tidy and the staff were very helpful towards us, we will stay there again. The pool was well maintained and the proximety to the beach was fantastic. Thankyou again for your wonderful service and communications, we will use you again. “ Hotel Neon was great, on arrival we checked into are room to find it was two single beds, we spoke to Nikos the manager and he swopped our room immediatly with no problem at all. the staff were friendly and always helpful and taught us greek which was fun! Although the rooms were basic they were cleaned everyday with fresh sheets and towels provide which is all you really need. I would recommend Neon to Couples, young groups and even families with children over the age of about 5.